This collection consists of Brian Burke's records from his work in the Domestic Policy Council. 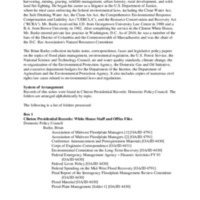 Specific topics include: Midwest flood plain management; environmental regulations; the U.S. Forest Service; the National Science and Technology Council; air and water quality standards; climate change; re-organization of the Environmental Protection Agency; the Domestic Gas and Oil Initiative; and departmental budget priorities for the Department of the Interior, the Department of Agriculture and the Environmental Protection Agency. This collection consists of Mr. Schmidt’s notes, correspondence, faxes, legislative policy papers, related law cases and departmental budgets.